I’ve been making this a lot lately as a starter or a main and it always goes down a treat. It’s relatively simple but with maximum flavour. I served it at a dinner party with 14 of my mates at the weekend as the main with brown rice, kimchi, edamame and everyone cleared their plates. I would recommend the darker miso paste for this as the flavour will be more intense in the roasting. It’s actually pretty good as is but the tahini cuts throw the sweetness adding more depth. It’s meaty but it’s not meat! Score the aubergine flesh in a criss-cross without piercing the skin and place into a baking tray lined with baking parchment. Mix all the ingredients together for the miso sauce and spoon about 1/2 the sauce over the aubergine halves making sure it goes into all the gaps. Leave to marinate for 25 minutes cut side up. Then cover tray top with tin foil and bake in a preheated 190 degree oven for 20 minutes. Remove from oven and uncover the tray. Mix any remaining sauce with the sunflower oil and spoon over the tops again. Return to the middle of the oven for 20-30 minutes or until the flesh is very tender, almost collapsing and the tops are caramelised. While the aubergine is roasting you can start on the tahini sauce. Mix all the ingredients together in a small bowl and use a few tablespoons of cold water to loosen the tahini to a good dripping consistency. 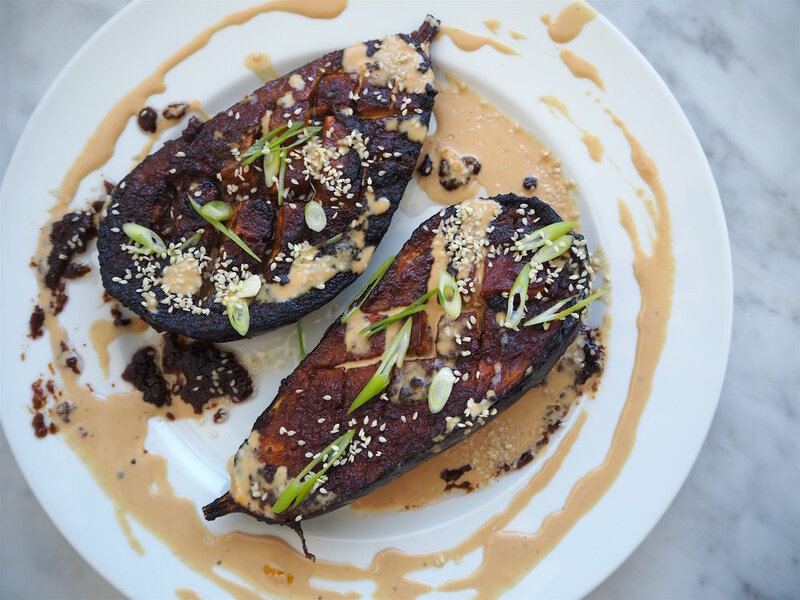 Serve miso aubergine with short grain brown rice, spring onions, sesame seeds and the tahini drizzled on top!